It’s now late May, and spring has only just turned up here in the UK. It’s been cold, it’s been rainy, and up until last weekend there hadn’t been all that much sun. I know, I know, anyone reading this outside of the UK probably assumes that’s what British weather is always like. But in reality, it isn’t – I don’t actually remember the last time the weather was this awful. April was the wettest in 100 years, and May, up until last weekend, wasn’t exactly parched either. There wasn’t a complete absence of sun, however. As is often the way in spring, the weather has been spontaneously changeable, and downpours have given way to sunny spells in an instant, and vice versa. When the rain swaps out for sun, sometimes you’re lucky enough to see a rainbow. Early one evening last month, as the sun was setting, I looked out of the window to see the above rainbow proudly stretching across the sky. 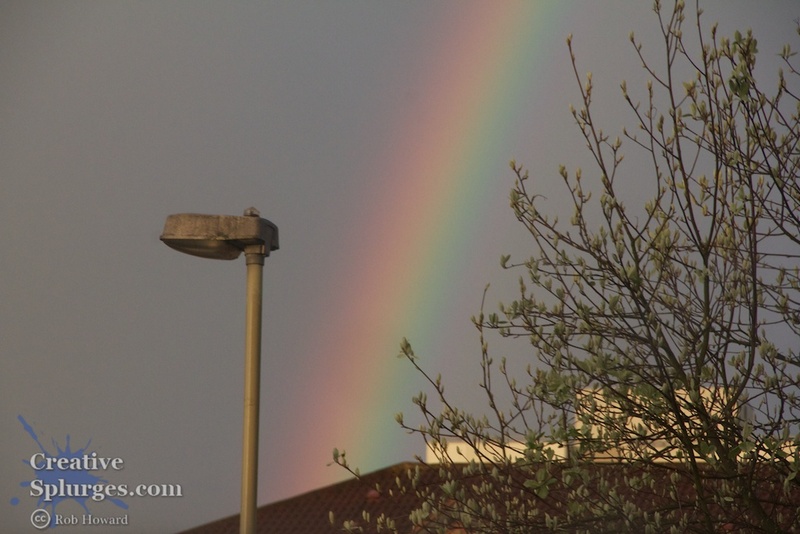 This marks one of the first times in the history of all things that I’ve seen a rainbow and had my camera on me. 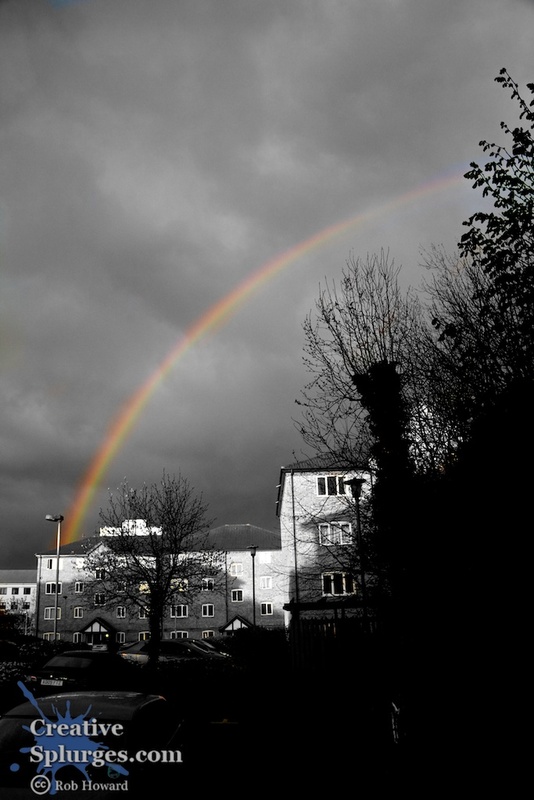 The last time I tried to photograph a rainbow it was with a low quality camera, probably some crummy little Sony Ericsson number or possibly the original iPhone. Either way, not really the sort of camera you want to be capturing this sort of moment on (in the defence of the original iPhone, it had a very good camera when held up against other two megapixel phone cameras, but it’s not a patch on later iPhone cameras or, of course, a decent DSLR). So, I whipped out my camera and decided to grab a few shots. I’m currently going through a phase of having my polarising filter stuck to my 18-135mm lens. It happens from time to time, both this and my UV filter have gotten stuck at some point. It could be because they were cheap, or that I screwed them on slightly skewed, but sometimes they just won’t budge. The polarising filter presents an extra challenge because its front section rotates freely to polarise different orientations of light, making it difficult to get a decent grip on the thread. Ultimately this meant I had my polarising filter attached when I saw the rainbow, so I didn’t even have to think about it. I’m sure I’d have forgotten otherwise. The polarising filter does a good job of bringing out the colours of the rainbow (all of them, as it were). One thing I didn’t know, however, is that a polarising filter can also completely remove a rainbow, should you so desire. Perhaps it’s ruining the perfect monochrome landscape shot or something. Useful to know. 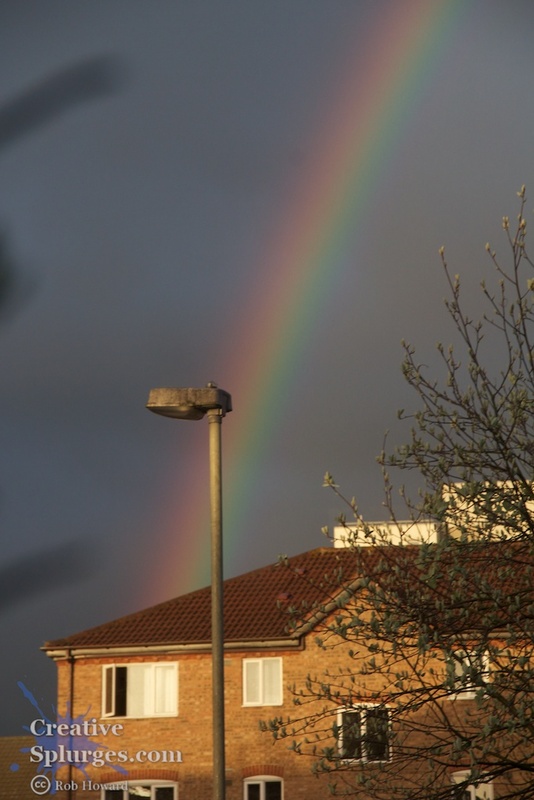 I’m not entirely certain why this happens, the light from the rainbow must be polarised in a particular direction, presumably as a result of the diffusion that created it. For most of these images I was shooting at a reasonably small aperture, the theory being I wanted to keep the foreground elements in focus without defocussing the rainbow too much. The rainbow being a rainbow it’s really hard to tell if that has been achieved or not, but at least it was something I was considering as I was shooting. As this was shortly after a rainstorm, there was some droplets of water on the window through which I was shooting. I swapped to my macro lens to attempt to capture the rainbow diffracted in the droplet, akin to this incredible shot or some of the work done by H₂O by Joanna. Unfortunately, none of them came out; none of the drops were suitable and I had great trouble getting anything in focus. 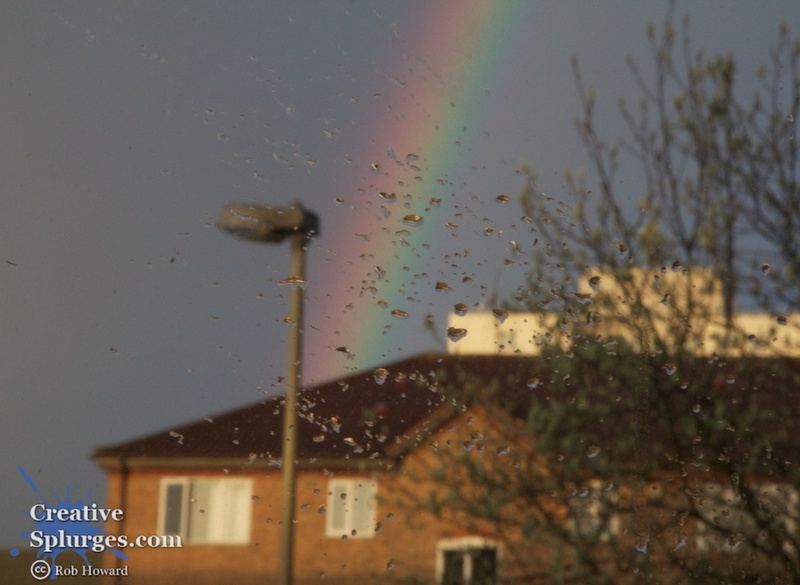 So I swapped back to my work-a-day lens and attempted to capture the droplets on the window whilst still getting the streetlight and rainbow in focus. To do this, I closed up the aperture as tight as it would go, and if I was still only blogging to half a dozen people that would be the point where I would have made a dirty joke. The 18-135mm lens can achieve f/36 at the extreme of its zoom, allowing for a pretty wide depth of field. However, by focussing on something pretty close to the camera, even an aperture of f/36 was not enough to extend the depth of field the fifteen metres or so to the other side of my flat’s car park, where the lamppost was situated, let alone the (probably more than) fifty metres to the block of flats in the background. 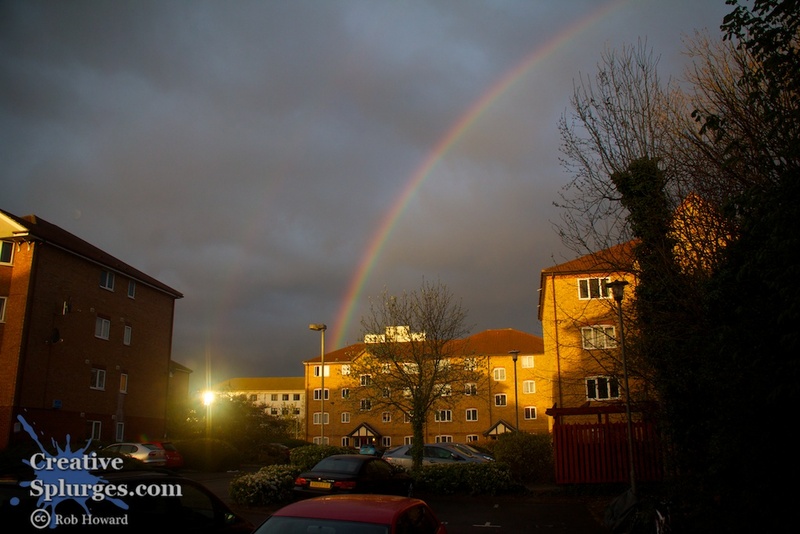 It’s worth noting there was no discernible effect on the sharpness of the rainbow. Another lesson learnt: focussing doesn’t matter when photographing something that is inherently out-of-focus. As is often my way when dealing with seemingly simple yet infrequent occurrences, such as a rainbow that should theoretically be covered by a single photograph, I took a number of photographs of marginally different angles, orientations and levels of zoom. Once at the post-processing stage, I played about with different ways of making the images interesting. This next shot is the best of the batch, in my opinion. I would love to say that this image was created using my preferred technique of removing select colours leaving only one, but that wouldn’t work in this case. Turns out that the saying ‘all the colours of the rainbow’ has a basis in fact. Instead, I had to use a monochrome brush and ‘paint out’ the colour from the rest of the image. 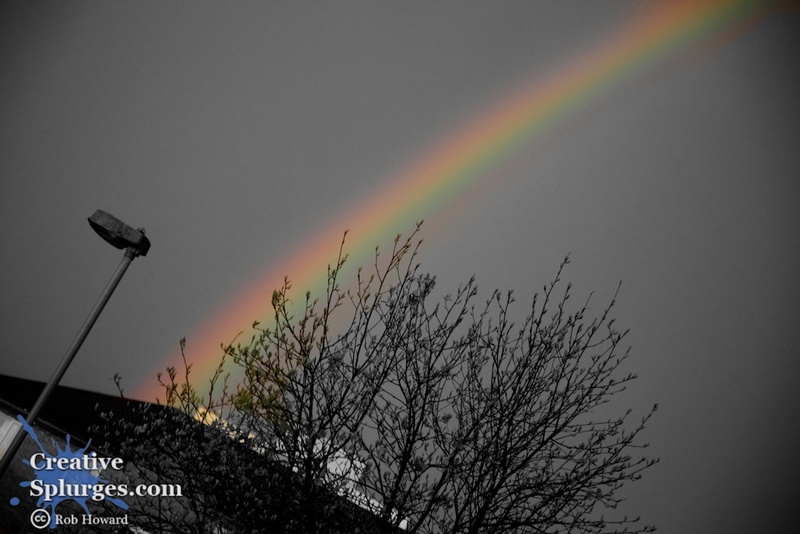 Doing it this way proved a bit of a challenge, because of the blurry indistinct nature of the rainbow. The brush edges can be softened, sure, which helps, but even then not being able to track quite exactly where rainbow ends and sky begins made it difficult. It was not quite so hard on the above image, which was quite a wide shot, but the closer angle in the following image proved very tricky. If the colours look a bit strong in this image, it’s because in addition to desaturating the rest of the image I boosted the saturation of the rainbow a little. Seems to have done the trick, although it has helped highlight my poor brush skills. 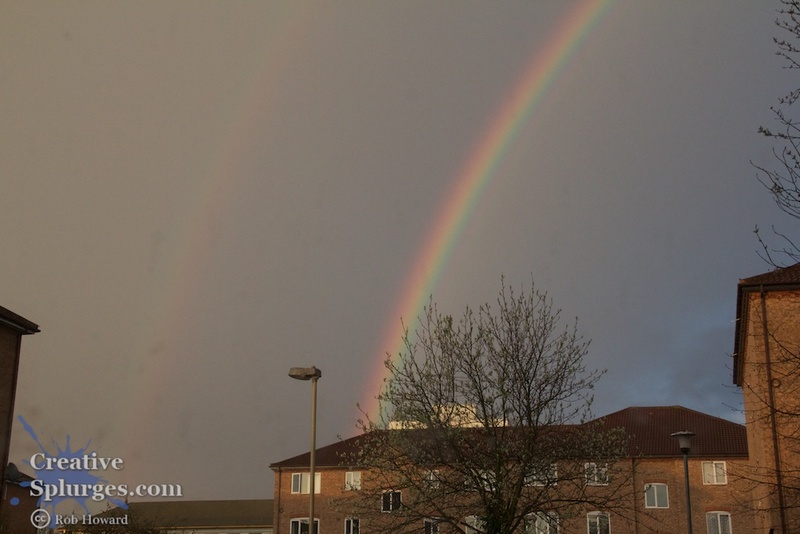 As I was finishing up, the second ring of the rainbow started to become more prominent. A double rainbow! But what does it all mean? Interesting experiment with the colour-selection bit for the rainbow, I like the idea and the first one you posted was the best – funny how the more subtle shades like blue and green get lost though. Well, probably not funny if you know your physics (as everyone except me seem to). The first monochrome image is my favourite of this set. Ironically, not for the colour of the rainbow but the detail in the housing.